Remember when we told you about how Singer, the gloriously OCD re-makers of Porsche 911s into incredible works of automotive art, teamed up with Williams to design an all-new 500 horsepower, naturally-aspirated air-cooled flat-six engine? Sure you do. 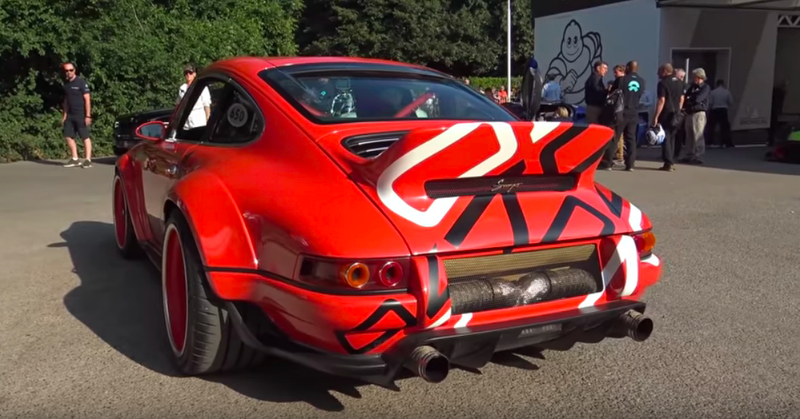 Now you should just sit back and listen to it as it flings around the new Singer-Williams DLS. This is the Singer Vehicle Design DLS Goodwood. The DLS stands for “Dynamics and Lightweighting Study,” and it’s a 1990 Porsche 964 whose owner requested Singer and Williams restore and modify his car with an emphasis on—you guessed it—reducing weight. And as you probably guessed from the name, it’s set to debut at the Goodwood Festival of Speed this weekend. Dear Car-Zeus that sounds good. The engine revs up to an insane 9,000 RPM, which may explain the funny feelings you get in your netherwhatsits, an area known to be affected especially by sounds resulting from 8,000 or more crank revolutions per second. The engine also has an amazing look, and I think those intestinal-looking white headers play a large role in how this thing sounds. Anyway, we just felt it was important for you to see and hear this.